Fear of foreigners dumping U.S. bonds has periodically resurfaced for as long as most market participants care to remember. One country’s trade deficit is another one’s surplus (although they puzzlingly never net out globally). In the U.S., we import more than we export, and conveniently the surplus dollars our foreign trade partners accumulate are partially reinvested back into U.S. government bonds, which helps finance our Federal budget deficit. 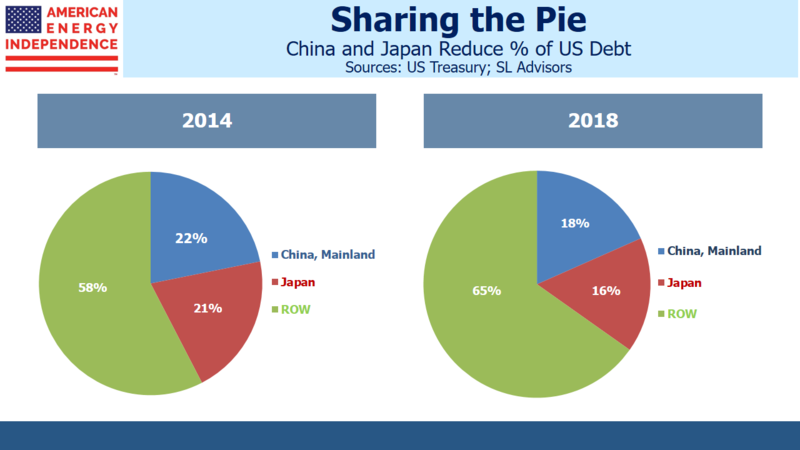 China and Japan have historically been the biggest foreign investors in U.S. debt, each holding over $1Trillion for the past several years. 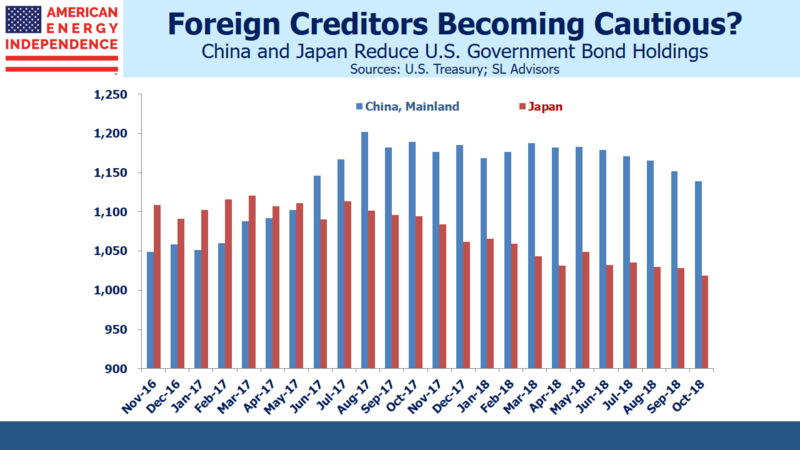 Last year, China replaced Japan as our biggest foreign creditor. From time to time, some commentators have warned that China retained the ability to inflict havoc on America’s bond market if they decided to sell a chunk of their holdings. Their willingness to maintain such substantial holdings of government bonds presumably contributes to today’s historically low long term rates. Trump has imposed tariffs on Chinese imports with little regard for such concerns. Following the 2016 election, China increased its U.S. bond holdings substantially. Japan was more cautious. But both have been reducing them over the past year. China’s moves have been more recent, and coincide with the growing trade spat. Interestingly, there’s been no discernible impact on bond yields. China owned as much as 22% of all our foreign-owned debt five years ago, and is now down to 18%. Since May they’ve shed almost $60Billion, with no visible market impact. The idea of the U.S. as supplicant to foreign creditors never made much sense to me. China owns what they own because it suits their purpose. They clearly perceive enormous value in U.S. sovereign debt, because they’re not earning much interest. So the idea that they’d sell a large chunk because of a dispute has never seemed logical, as I wrote in Bonds Are Not Forever; The Crisis Facing Fixed Income Investors. If you owe a trillion dollars, your creditor has much to worry about. Sure enough, there’s been no mention of foreign bond sales during the recent bout of trade friction. China has quietly reduced its holdings with little fanfare. Interest rates have remained low, even with the Federal Reserve raising short term rates and unwinding quantitative easing. The fear of foreign sellers driving up U.S. mortgage rates has even less basis than in the past. Although the Fed is expecting to raise rates twice next year, bond yields continue to forecast less than that. For fixed income investors, it continues to be hard to beat inflation after taxes. Equities are cheap as shown recently by the Equity Risk Premium (see Stocks Are the Cheapest Since 2012). The American Energy Independence Index yields 6.9%. Bonds are unlikely to provide much value.